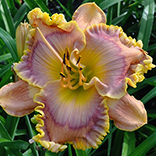 ORANGE SPICE (Dan Trimmer) Diploid (Unknown x Unknown) 40" EMRe. Ev. 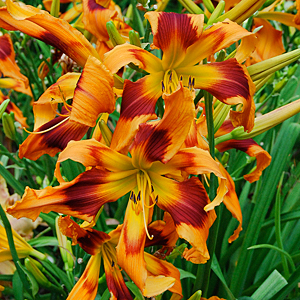 8" Best described as a "riot of color" Orange Spice is a bold orange with a dark plum red eye surrounding a large green throat. A profusion of blooms from several undivided clumps forced me to introduce this diploid of unknown origin.